The Integrated Monitoring Initiative is funded by voluntary contributions by external support agencies that wish to support SDG 6 monitoring and reporting: Germany, the Netherlands, Sweden and Switzerland. In addition, custodian agencies are receiving voluntary contributions from other support agencies that wish to support capacity building, data collection and reporting for individual indicators. Where do we add value to Member States? More holistic policies: Water and sanitation policy by its very nature needs to take into account a number of interrelated issues including supply, consumption, resource management, and environment, and to involve a wide range of sectors and stakeholders. A comprehensive data set allows for better informed policy and investment decisions that account for synergies and trade-offs between them. Stronger accountability: A holistic and regular supply of data enables greater transparency and reduces the incidence of waste and corruption. Leaving no one behind: Data disaggregation, a key principle of SDG monitoring, will help to identify the populations with unmet needs and higher levels of risk and to target policies and investments to reach those who most need it. 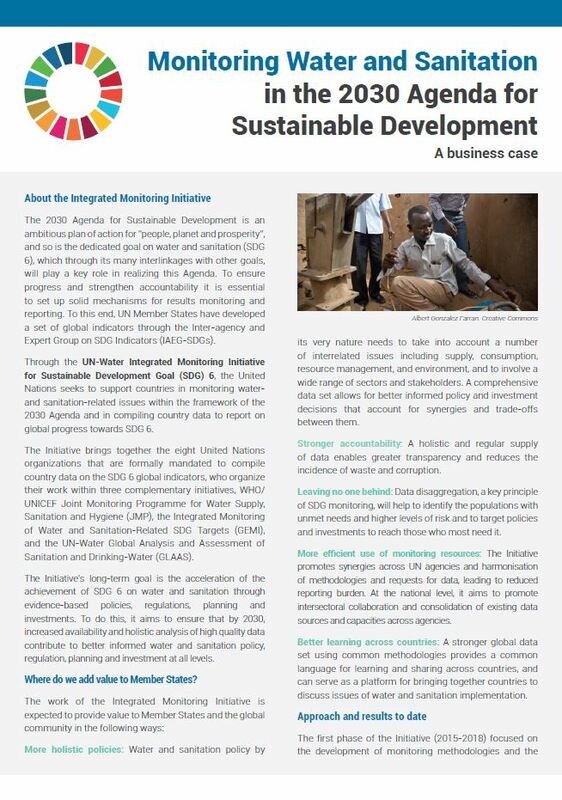 More efficient use of monitoring resources: The Initiative promotes synergies across UN agencies and harmonisation of methodologies and requests for data, leading to reduced reporting burden. At the national level, it aims to promote intersectoral collaboration and consolidation of existing data sources and capacities across agencies.